The VWR GalaxyMini Centrifuge is an affordable and dependable low speed personal centrifuge. Ideal for quick spins, microfiltration and cell separations, this compact minicentrifuge can be placed just about anywhere, on your workbench for easy access or even in a cold room. 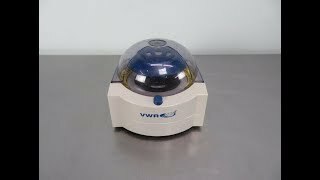 The VWR Galaxy Microcentrifuge quickly starts and stops quickly, and can be automatically started when the clear lid closes and locks into place. This microcentrifuge has a speed of 6000 rpm, with a RCF of 2000 x g.
13.2W x 15.5D x 11.2H cm/ 5x6x5"
This VWR Galaxy Mini Centrifuge has been tested and performed just as expected. All of our lab equipment comes backed with our standard warranty. Should you have any questions, please don't hesitate to contact us.